According to Zillow.com, homes that are listed from April – May are sold nine days quicker and for nearly 1% more than the average listing. That prime selling time is quickly approaching. If you are getting ready to sell your current home, a fireplace can greatly add to your home’s value. Realtor.com has found that 60% of homebuyers list a fireplace as the Number One feature they want in their new home. We can help you decide on the type of fireplace, the locations (geographically and within your home) that can add the most value, and the features and benefits you can add to your home’s selling description. 59.6% of homebuyers are seeking a wood fireplace for their home and are willing to pay, on average, $5,000 more for a home that has one. (Angieslist.com) Depending on the location and type of home, a wood burning fireplace can be considered almost a necessity for a homebuyer. For instance, a home in a remote, wilderness location will almost need a wood fireplace due to frequent power outages and wood resources being readily available. However, even coastal luxury home trends are increasingly moving toward wood burning when it comes to fireplaces due to the “romance” feature that the crackling of wood can bring. A wood fireplace brings the most value if it is in the “main” room of the home. This is the space that your family most often gathers in; the great room, family room, etc. You can heat the room that the fireplace is in and often beyond that, especially if you have an Acucraft fireplace in your home. If you are finding that buyers in your location aren’t seeking heat from a wood fireplace, our wood fireplaces comes standard with a gas knockout. Our gas knockout can convert your current wood fireplace into a gas fireplace that won’t heat your home as much or as quickly. Although only 21.56% of homebuyers admitted that they prefer gas fireplaces (Angieslist.com), that number is on the rise. 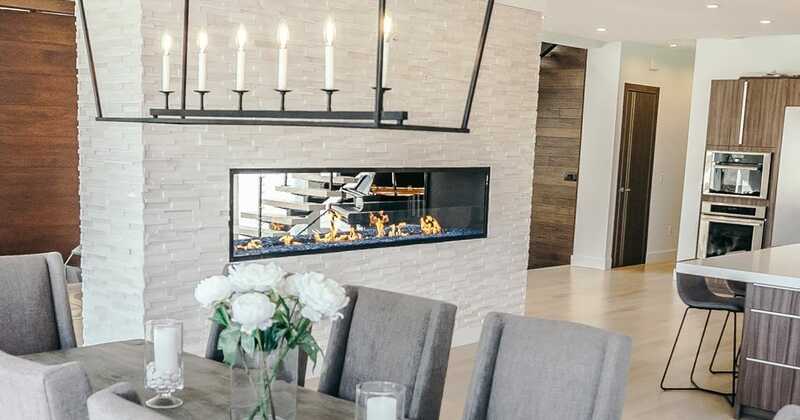 As gas fireplaces evolve, the younger generation of homebuyers are moving toward gas over wood due to simplicity of use and elegance brought to the space. And, similar to wood fireplaces corresponding to geographic location, gas fireplaces are almost considered a necessity depending on the location of the home, size, and base price. For example, luxury homes on the coast “need” to have several gas fireplaces in order to even be in the same realm of the homes in the same neighborhood. Interest in outdoor fireplaces are on the rise. Currently, 18.84% of homebuyers prefer an outdoor fireplace to any other type of fireplace (Angieslist.com). However, depending on how the fireplace is utilized, it can raise the value of your home over $15,000 (2016 Survey of Real Estate Agents). Extending your living space outdoors, especially in warmer climates, is extremely popular. Providing a patio with space for outdoor seating, a grill, and a fire feature can dramatically affect your home’s value. The popular “outdoor living” aspect is even on the rise in colder climates as well. This is true for gas and wood fireplace options as well as indoor/outdoor fireplaces. Adding an “outdoor living” space to your home is seen by potential homebuyers as additional square footage. Although some older homebuyers may not see the value, the younger homebuyers know the potential. An outdoor fire burner, fire table, or fire pit is also the easiest fire feature to install and set up for a home; so it’s the easiest way to have fire increase your home’s value. Having this outdoor space combined with a fire feature is also considered a “must-have” when it comes to large, luxury homes. Fireplaces in homes remain a hot commodity (no pun intended). Potential homebuyers know the value a fireplace can bring and take that into consideration when purchasing their next home. No matter what type of fireplace you have, where it is in your home, or where your home is located, it is also a “luxury” item that is high on homebuyers’ wish lists. Whether you are buying or selling, consider an Acucraft fireplace for your home. With unlimited fireplace options with wood, gas, and outdoor, you are sure to strike a cord in any potential or future homebuyer for your home. Contact Us Today To Learn More On Increasing Your Home’s Value! Call Your Fireplace Advisor Today!